Sophomore Kenya Earl is an absolute superstar. Number 34 on the court, a forward from Iowa City, Iowa has been dazzling the Lawrence community from the first day she set foot on the court. Earl is a lot like everyone else you know, loving naps and Netflix in her down time, but the difference lies in her basketball skillset. Earl has received Midwest Conference Player of the Week, Viking of the Week and many more admirable awards voted on by the community. Kenya Earl averages 17.4 points per game, 8.6 rebounds per game, has a 36 three-point percentage and is shooting 82.6 percent from the line. 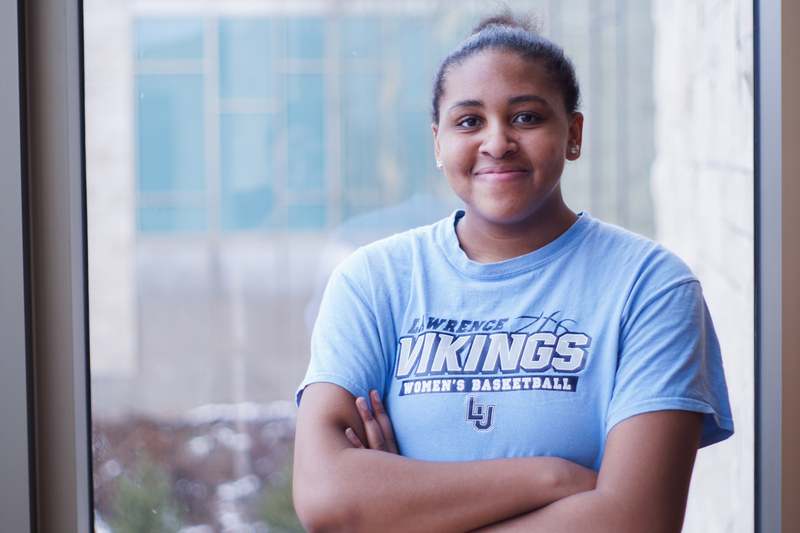 While the women’s basketball season has not been what the team was shooting for, Earl has nothing but positive things to say about her team and her basketball experience. Last Saturday, the Vikings travelled to Ripon College to face the Red Hawks for the second time this season. They took the loss, with a final score of 63-51, but Earl stayed positive. “I thought we played pretty well. They’re the top, number one team in the conference and we hung with them for the majority of the game. So, I’m pretty proud of us. It was exciting to see us play hard throughout the entire game.” While their record may not reflect it, this team has taken big strides from where they started this season. Constant improvement is obvious from the perspective of a spectator. Earl has had a long career, and still has two collegiate seasons left to play. “I’ve been playing since age 5. Played a lot of AAU growing up. My dad coached my team for a while. I played high school ball and played for a number of teams throughout the state. I merged with programs to get better exposure. Got looks at colleges, a lot of D1s and some D2s. And then senior year, recruiting wasn’t going as well as I’d like, so I wasn’t sure if I was going to play college basketball. Then, my all-star games came after my senior season; I had three of them, and I realized I couldn’t go through college without playing basketball. So, I decided to keep looking for schools and that’s when Coach Wellman, our previous coach, started recruiting me. I came on a visit here and loved it. I committed a couple weeks later, and now I’m here.” Earl loves the way the team greeted her on her visit here. “When I came on my visit, the team was really welcoming. Every single person was there to greet me when I arrived. We walked through campus together as this big blob of teammates and I really appreciated that. I also liked how the campus looked, and the education attracted me. The class sizes were small and I liked how they set you up for post graduate,” said Earl. Her goals are to graduate with a biochemistry degree and pursue pharmacy post-graduation. It’s obvious that she not only leads on the court, but also in the classroom. Basketball is an action packed and intense sport to be a part of. Earl recalled one of her favorite basketball moments of all time: “It would have to be in high school, going against our cross-town rivals. Playing at their place my senior year. We were tied and I hit a 3 to go up and the crowd went wild and the gym was packed. We ended up winning the game.” When asked if she had a favorite moment in Lawrence basketball, earl responded, “Last year getting our first conference win against Illinois College at home. I didn’t even know it was our first conference win in years. After the game, we were so excited in the team room and my teammates were crying and I was like ‘Why is everybody crying?’ They all explained that they haven’t won a conference game in years. And I was so moved. Parents came up to me after the game saying things like ‘I’m glad you’re here.’” Everyone is excited and happy that Earl chose Lawrence as her collegiate home. The last chance to watch Earl and her teammates in action at home is Saturday, Feb. 9 at 3:00 p.m. against Cornell College.